Back in the day, when I was active in singles ministry, I participated in the Singles Christmas Pageant every year. One year I was Beth Bradley in “The Greatest Christmas Pageant Ever”. Another year I was Peppermint Patty in “A Peanuts Christmas”. Then there was the year I played Lil, a New York apartment building maintenance woman in a production called “I’ll Be Home For Christmas”. Set in late 1941, this is the story of a family’s faith and a nation on the brink of World War II, preparing to celebrate the birth of the Christ. 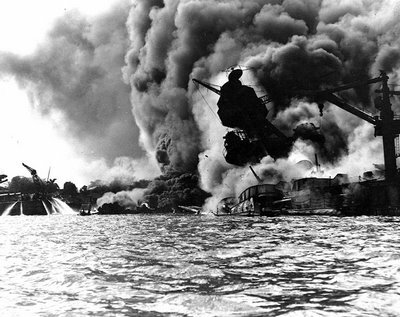 It contains a scene in which the entire cast is crowded around the radio, listening to FDR’s “a date that will live in infamy” speech following the bombing of Pearl Harbor. That speech can be found here. Something interesting happened the year we did that play. We usually did a dress rehearsal on the Thursday night before the Friday of the Singles Christmas Pageant. That year, the adult Sunday School department at the church asked if they could be the audience for the dress rehearsal for their Christmas Party. And so it happened that we ran the play twice… once for the seniors and once for the singles. The difference in the audiences was stark. The singles enjoyed the performance for certain, but the seniors, while they enjoyed it, were taken down memory lane to that terrible day, December 7, 1941, a date that will live in infamy. After performing for the seniors, dozens of them came up to the cast to share their own personal recollections of that time, recalling where they were when they listened to that radio broadcast live. They all wanted to share- wanted us to really know and understand- what it was like to be there during that time. Today is December 7th, 2011. Seventy years have passed, and so have most of the people who were alive during that time. I have seen one or two news stories about that day, and seen several facebook statuses about it, but mostly it seems to have become another historical fact for “This Day in History”. Is that good or bad? I suppose it is both. It is bad because those events and the people who were affected by them deserve to be remembered. But also good, because it shows that we are a nation that has healed from it. Now think of this in light of the events of 9/11. We are ten years out from these events, and yet they are still as raw and fresh for some as the day that they happened. If in 60 years it is remembered as a terrible, but important, footnote in history, much like Pearl Harbor, will that be good or bad?